It's not the Nokia / Microsoft lovechild we've all been patiently awaiting here in the states. No, it's the other Lumia -- the low-end one. And it's headed for a berth on T-Mobile's airwaves next week, on January 11th. Rather than go big (or go home), Espoo's chosen to wade gently into the shallow waters of the US smartphone market, loading this budget Mango device with respectable mid-range specs and an irresistible price. The Lumia 710 is a $50 on contract proposition geared towards easing folks inept at the smarter aspects of wireless gadgetry into the 21st century. With a 3.7-inch ClearBlack LCD display, a 1.4GHz Snapdragon processor aided by 512MB of RAM, a decent 5 megapixel rear shoot capable of 720p video capture and, of course, Windows Phone 7.5, it may do just that. The obvious hurdle keeping this able phone from flying off the shelves has little to do with performance and everything to do with Nokia's stateside brand recognition. So, join us after the break as we put this unassuming handset through its paces and determine whether or not the 710's training wheels are worth a Grant. Nokia's first stateside Windows Phone Mango handset is an all around solid performer and for the budget price, it's a must-have. How would you rate the Lumia 710? When Nokia trotted out the Lumia 800 a few short months ago, it shone brightly amidst the clutter of high-end, samey handsets and hinted at an exciting future of mobile design. True, that phone's casing is simply a rehashing of the D.O.A. 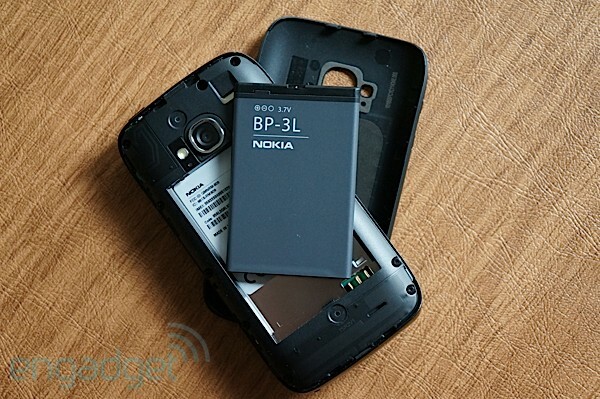 though much loved N9, but a similar recycling would've been much welcomed here. Instead, the 710 is, at best, inoffensive and a copycat of the Nokia 603; it disappears into the hand and garners no affection for its oddly-tapered rectangular shape. Weighing in at 4.6 ounces (129 grams) and measuring 4.7 x 2.5 x 0.5 inches (119 x 62.4 x 12.5mm), it's considerably lighter than its carrier rival, HTC's Radar 4G, although both go nearly toe to toe in dimensions. 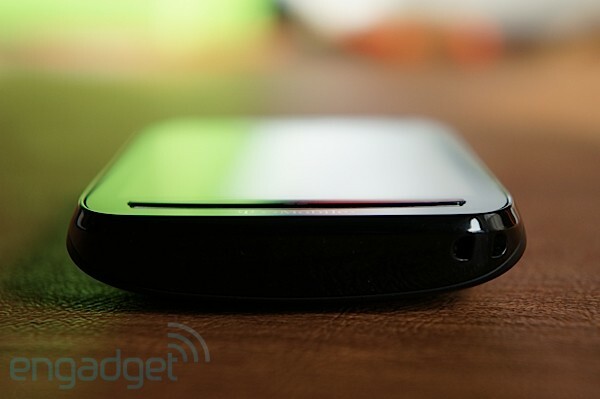 The 710 may simply appear to be the thicker of the two, owing to its smoothly curved back. Speaking of that posterior, a coating of soft touch, black plastic spreads across the entirety of the 710, extending to its similarly colored edges. Indeed, it feels excellent in the hand and those tapered corners make for a comfortable resting spot for thumbs when held in portrait and pointer fingers when in landscape. It's not a shabby build by any means, but you'll definitely encounter a fair share of squeaks and creaks when gripping the handset. 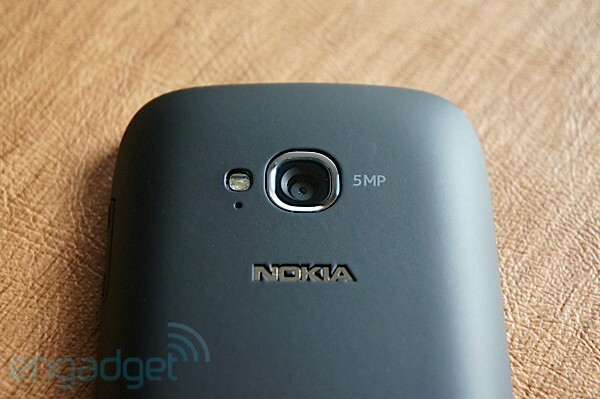 The phone's five megapixel camera with f/2.2 lens and LED flash sit right above Nokia's logo up top, while a speaker grill stretches across the bottom. Look to the left side of the device and you'll see a recessed notch for removing the casing (which you'll be able to swap out for more colorful backplates via T-Mo), underneath which lies a 1,300mAh battery and microSIM card slot -- that's all. There's no microSD slot for expandable storage, so you'll have to make due with 8GB. Both the volume rocker and dedicated camera button reside on the right of the 710, but they're nearly indistinguishable from the phone's seams, despite a bit of raised texturing on the former. More often than not, we found ourselves continually checking to see if we were pressing in the right location to control sound or activate the camera. The same can't be said of the power button, situated up top to the right of the micro-USB port and headphone ports, which sticks out just enough to signal its placement without interrupting the device's profile. 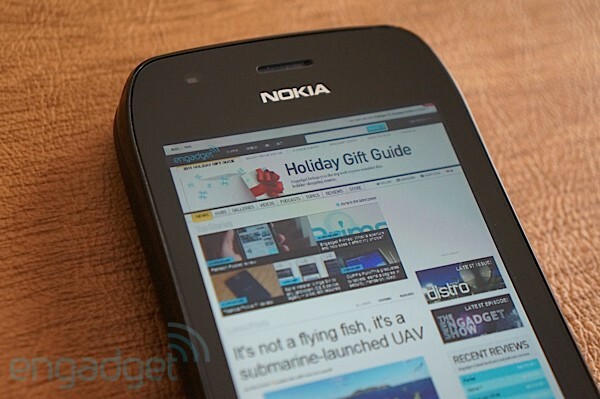 On the front face, the diminutive earpiece is centered atop Nokia's logo, leaving the unbroken, soft click WP navigation button to border the screen's bottom. Forget AMOLED: that stunning display tech is reserved mostly for the mobile world's big guns (see: the Lumia 800). The 710 isn't privy to that oversaturated treatment, but its 3.7-inch 800 x 480 ClearBlack LCD does a surprisingly good job, especially when pitted against the Radar 4G's (comparatively) dull Super LCD screen. Viewing angles hold up just as well as they do on the 800, though you'll notice the 710 falls prey to significant washout, rendering our chosen purple theme slightly pink-ish when tilted. We didn't encounter any significant difficulty reading the screen outdoors, but in direct sunlight, expect to bump brightness up to high. 1,300mAh isn't the amount of juice we'd necessarily recommend for a daily driver, but somehow the Lumia 710 makes it last just long enough. Riding along T-Mobile's HSPA+ 14.4Mbps network, the phone doesn't fall prey to the excessive drain we've seen on the carrier's faster HSPA+ 21 and 42 devices, like the Amaze 4G. Even under moderate to heavy usage, we managed to eke out nearly a full day's worth of productivity on a single charge -- about 17 hours. That's with Twitter set to sync at 15 minute intervals, one push email account, brightness at 50 percent, GPS and WiFi enabled, some light browsing and streaming video consumption -- not bad for a $50 handset. The 710, however, didn't fare so well in our formal battery rundown test, giving up its Li-ion ghost after two hours and 35 minutes. They may all be separated by different device manufacturers, but there's a similar thread linking all of the above Windows Phones we pitted against the Lumia 710: a Qualcomm MSM8255 chipset complemented by 512MB RAM. Save for the Titan which clocks in at 1.5GHz, the rest of this Mango bunch make do with a slightly slower 1.4GHz Snapdragon CPU. Of course, the beefier Titan reigned supreme in all categories, but the 710 did manage to more or less keep pace with its prettier Lumia sibling in both WP Bench and battery drain, as well as besting it and Samsung's Focus Flash in SunSpider at 6,826ms. Considering the Lumia 710 is being marketed as a starter smartphone, you can bet its intended demographic will be making heavy use of its voice capabilities. We placed several phone calls around the New York City area and while T-Mobile's service isn't the most robust, callers continually came through loud and clear. The speaker was also exceptionally powerful, although voices were subject to a bit of distortion when volume was pumped to maximum. 2011 was undoubtedly the year of 4G what with its bevy of LTE and HSPA+ 21 / 42 devices flooding the market and clamoring for your disposable income. This Lumia is not that 4G fast, but it doesn't need to be as its target demo isn't likely to consume mass amounts of data -- just yet (baby steps, baby steps). Running on T-Mobile's 14.4Mbps network, the 710 consistently delivered downlink performance ranging from 5Mbps to 2.5Mbps and uplink from 1.05Mbps to 0.96Mbps -- that's if you happen to be in a strong HSPA+ coverage area. In our time testing the handset in New York City, we never saw network speeds drop below or even rise above those aforementioned maxes, but should you live on the periphery of Magenta's footprint, anticipate slower results. To get a sense of just how serviceable the Lumia 710's multimedia capabilities are, we streamed video from both the included T-Mobile TV and Netflix apps. Though it did require a bit of buffering before our selected content would begin playing back, when it did picture quality was noticeably smooth and only intermittently resorted to pixelation if signal strength dipped. While we wouldn't necessarily spend an hour squinting at the Lumia 710's 3.7-inch screen, it could definitely serve as a momentary distraction while whittling away time on a bus or in a waiting room. Oh, and if you're eager to share your mobile connection with a nearby laptop or tablet, you'll have to look elsewhere. 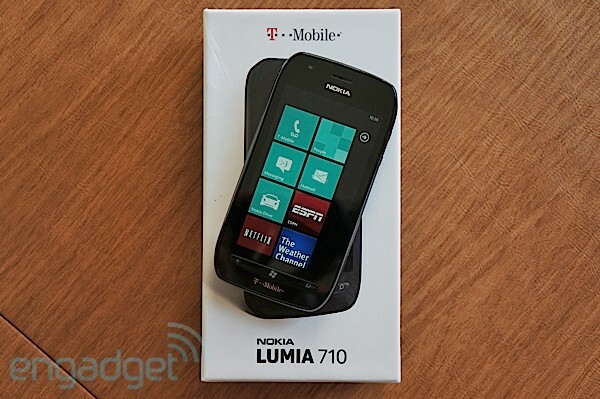 Unlike other WP 7.5 phones, the 710 does not come with Internet Sharing enabled. If you count yourself amongst the snap and shoot then upload to Twitter / Facebook / Google+ set, skip this section and set your sights on other mobile devices. The Lumia 710's five megapixel rear shooter with f/2.2 lens is a massive underwhelmer and stops just short of being totally unworkable. It's a confounding experience, with a hit-or-miss autofocus sensor that borders on schizophrenic, occasionally resulting in decent to above average shots -- surprising, given Nokia's track record for imaging on low-end devices. And as if locating the phone's dedicated camera key wasn't hard enough, finding a happy medium depressing this button to focus on objects is yet another exercise in frustration. There's also an apparent disconnect between the image captured on the 710's display and the final result -- snapped pics appear blurrier on screen than they actually are when you transfer them to a computer. Oftentimes, we would dismiss our picture taking as simply more fodder for the recycle bin only to later find we actually had a collection of perfectly acceptable shots. Despite our attempts to master the module, varied lighting conditions proved too much for the 710, forcing us to continually adopt an array of settings to find a happy medium. Auto is too unreliable for everyday usage, so if you intend to rely on this as your point-and-shoot, buckle up for a mix-and-match session of scene mode swaps. Even when awash in ample sunlight, we still found ourselves resorting to backlight mode to capture the clearest image. Video on the Lumia 710, however, seemed to be just the opposite. As you can see in our brief clip above, colors appear bright, moving objects remain mostly in focus and, although there are minor issues with image stabilization, the frame rate holds up well. Similarly, audio recording was excellent, with our voice coming across crisply. If you've ever spent time with Windows Phone 7.5, then you know exactly what's in store for you on the Lumia 710. Unlike the fragmented user experience offered up by Android and its various skins, Mango is solidly consistent. Sure, carriers and manufacturers may load the phones up with bloat, but in most cases that can be easily uninstalled, leaving consumers with that clean, live-tiled UI. The Lumia 710 is a breeze to navigate and it's clear why Nokia would choose to market to wireless Luddites and partner up with Microsoft. More so than iOS, WP tosses out the least amount of obstacles to immersion for the uninitiated. The home screen offers up an unlimited number of customizable tiles that launch their respective apps when touched. Swipe to the left and you're greeted by a list of all the handset's installed applications. Honestly, it goes no deeper than that and that's a very good thing for the tech-averse. Nokia and T-Mobile have both pre-loaded a good amount of apps onto the 710 and thankfully most of it harbors on the solid end of desirable. There's an exclusive ESPN app for scores, news and video, Netflix, Xbox Live, Nokia Drive and Maps, Slacker, T-Mobile TV and The Weather Channel. That's certainly a long list of apps, but with the rare exception, they're also miraculously uninstallable. The 1.4GHz Snapdragon processor makes the device a joy to use. You won't find the phone locking up and stuttering as you swipe between panes or even when launching apps; it's all relatively smooth sailing. Web surfing on the native Internet Explorer browser is, for the most part, speedy, with mobile pages rendering in under five seconds and full desktop versions coming under the 20 second mark. That's all fairly dependent on your particular network signal, so it goes without saying that plain HSPA will result in longer load times. Pinch to zoom is also remarkably fluid, keeping track of our fingers without any hesitation. When you stack the 710 up side-by-side with its sexier sibling the 800, you'll be hard pressed to find exactly what keeps this particular Lumia 90 points lower on the Nokia totem pole. It's certainly not the specs, as both handsets are nearly identical in that respect -- powered by a 1.4GHz MSM8255 processor, 512MB RAM and boasting the same undersized 3.7-inch screen, plus or minus the display tech. Really, it's the design (invisible vs. alluring) and camera module (five megapixel vs. eight megapixel) that drive a price gulf between these two Mango offshoots. Contrast the 710 with its other budget WP 7.5 peers, factor in that super affordable $50 on contract pricing and, hands down, it's easily the most attractive of the single-core lot. Will it succeed in giving Nokia the US market traction it's long sought after? Probably not. The Mr. and Mrs. Johnny-come-latelies of the mobile world will neither make nor break the company's stateside success. That heavy lifting will surely fall to future Lumia progeny of the higher-end sort. No, the 710 is a solid smartphone for first-timers marred only by its faltering camera and nondescript construction. If you're just learning how to surf the internets and / or send a text, this phone's for you.